Adam Lambert has crossed another bridge and has added more hardware to his ever-growing trophy shelf. 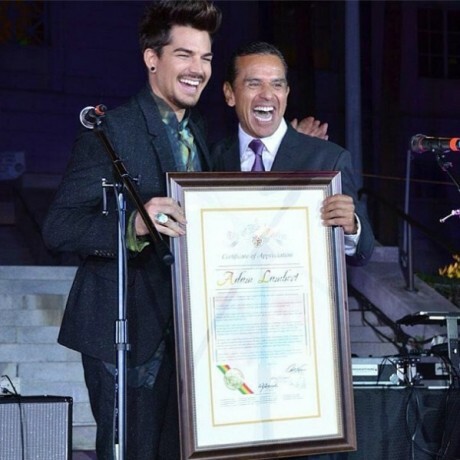 Adam Lambert and Los Angeles Mayor Antonio Villaraigosa. Photo courtesy of CoralMermaid. Adam’s well-deserved recognition came from the City of Los Angeles. A 2-day ceremony took place on May 30-31, 2013 and was part of the 3rd Annual LGBT Heritage Month. In addition to high accolades, Adam received a trophy and a large, framed certificate. President Wesson told his Sergeant at Arms that Adam was not allowed to leave until he had a picture with him. So, comedian that he is, Adam photobombed President Wesson! You’ll see this at the end of the first video. On Thursday in his speech, Mayor Villaraigosa called Adam a “beacon of hope” for children and teens across the country that battle discrimination and bullying. Upon accepting the award Adam shared that his personal mission is to continue to spread the word about the diversity of the LGBT community and to help people feel safe and comfortable. Thank you GaleCWhittington for the following compilation video. Thank you Janus Janis for the following video from the May 30 event. Adam your Official Unofficial fansite is so proud you and all that you have contributed to Los Angeles, California, the USA and the world! I know your fans join Lila and me in congratulating you for all that you have done and will continue to achieve! Geez, he’s a Glambert like us… well, maybe not as fervent as us, but he for sure paid attention when Adam was on AI! Being 76 yrs old and a great-gramma I speak from experience. To me, Adam is the best entertainer and one of the best singers EVER. Sinatra had a huge following and a way with words; Elvis shook up the girls, but Adam is their singing equal and has the greatest, most authentic personality… Keep it up, Adam, you are my Idol. Adam Lambert Joining American Idol Two More Times! Side-By-Side Freddie vs Rami Will Blow You Away! Queen + Adam Lambert Slay the Oscars!